Did you know that October is American Archives Month? Archives Month gives us a chance to recognize and celebrate the value of the historical record, and to attempt to increase public awareness of our awesome collections! 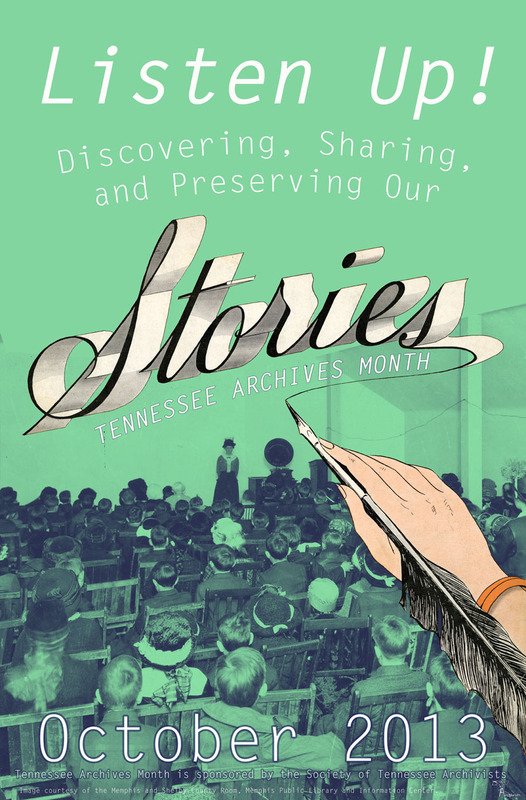 Different states offer different themes for their archives to interpret, and the Society of Tennessee Archivists’ theme is “Listen Up! Discovering, Sharing and Preserving Our Stories.” Here at the AGRC, we chose to create a slideshow highlighting some of the interesting stories from our collections. This slideshow runs on a television screen placed in the window of our reading room, so passers-by can stop and see these stories! I have included the slideshow for those who do not live near enough to stop by and see it. Hope you enjoy, and remember to celebrate American archives this month! This entry was posted in collections, Uncategorized and tagged American Archives Month, collections, Society of Tennessee Archivists. Bookmark the permalink.